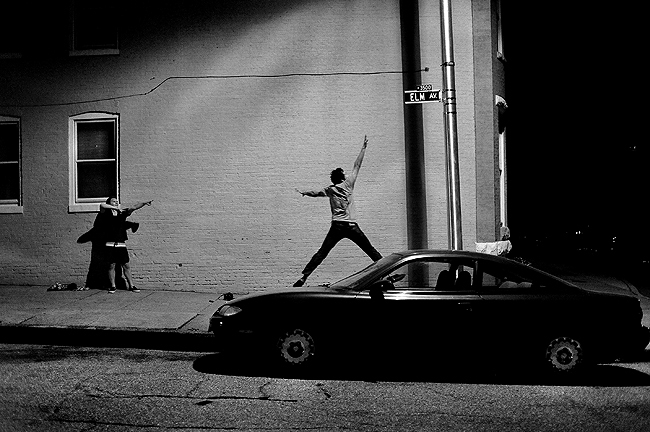 "Photographer Charlie Shoemaker attempts to "Air Jordan" his way up to the W.35th street sign in an attempt to touch it during a friendly jumping competition in Hampden on Monday night." I'm super competitive. Always have been. Always will be. It's just my nature. I'll take the most simplest of things and make it about me versus you. And when I lose, I'll dwell on it. But when I win. Oh, it feels so good. I wasn't going to post this, but Charlie made an awesome video as he normally does when we hang out. This was no exception. On our way back to Roth's house, randomly, Drew said OK, it's on as he looked up at the 35th and Elm sign in Hampden. With a couple beverages consumed prior, Drew made a competition out of who could jump and touch the W. 35th. sign on the corner. It took us a good 15 minutes of sweat and tears until I was the first to touch it. After that, Drew nailed it and it became a pride thing and see who could hit the sign more. Roth and Charlie failed miserably, granted they documented the battle between Drew and me. Finally, we got yelled at by a fellow Hampdenite to shut the F%$* up as he yelled from his window asking when we would be done. Now that I think about it, it was midnight...on a Monday night. Sorry, bud. What can I say though? It was a bunch of young Baltimore (and one DC) photojournalists having some fun and shooting in the process. What's wrong with fun, photos and video? With that said, I should dedicate this video and my performance out to my buddy Darnay (he doesn't have a link...he is a sportscaster), who would have destroyed us in this game. He has like a 90-inch vertical. OK, maybe 40? And at least seven-feet is an obvious joke. The sign was more like 12-feet-high. "Porter of Hampden, Md., enjoys an open hydrant on an unusually warm April night on Elm St. in Baltimore City, Monday night." I went out with some friends last night and on our way to the bar we noticed a couple of open fire hydrants. This girl, Porter, and her friend Reed (not pictured), were enjoying the pleasantly warm temperatures as they splashed around and chatted near the streaming water. They were really interesting and nice, as most people in Hampden are, and tipped us off to a couple cool little feature stories, events coming up this coming weekend. You never know what you'll see, who you'll meet and what they have to share. "Attempting to stay dry, and have a little bit of fun, a young boy from California covers his face with his poncho on the American side of Niagara Falls, April, 9, 2009." When you have a week off, what do you do with yourself? In this instance, I went to Canada. I had never been before and thought seeing Niagara Falls and Toronto would be an excellent way to: A. Travel; B. See something new; C. Get out of Baltimore; and D. Enjoy myself for cheap as opposed to traveling overseas. We didn't have much of a game plan and sort of improvised the entire trip. That became evident when we arrived and realized that it was more than 20 degrees colder than home. Why we assumed it would be the same temperature was beyond me, but at least I brought a ski hat. Our journey started in Niagara Falls, where it was windy, cold and desolit. Being the off season, not many people forgoed traveling to see one of the world's largest waterfalls. My first view of the falls of amazing. The entire drive north I tried to imaigine what it may look and sound like. But I had no idea it would be that intense until I saw it. We probably stared at it for a good 15 minutes every time we walked by it, too. I won't lie, you're so tempted to jump in and take a ride of your life. And you know everyone probably thinks that, as the fence could easily be jumped over without any problems. Niagara is pretty much in the middle of nowhere and very tourist based. One street looks like the boardwalk in Ocean City, Md. ; lined with arcade games, loud noises and amusements to keep an average 8-year-old occupied for days. Being, well, tourists, we did all the major attractions. However, we quickly learned that not everything is open. While it was spring back home, it was still winter in Canada. Snow covered the ground near the falls and giant chunks of ice floated in the water. We could not ride on the Maid of the Mist boat ride that takes you up close and personal with the falls, and we were limited to where, and how close we could walk to the falls on the walking tours. Apparently, everything opens in May. Oh, well. We still had fun. I had planned on making a small essay on Niagara, just simple audio and stills. And no, not like Magnum's Alec Soth, although I think his essay is very, very powerful and thought provoking. (Caveat: That link is NWS). But, as I mentioned, no one was there, attractions were closed and of those we did see, 95 percent of the folk were of foreign decent and didn't speak English. So I stuck with just shooting simple features. All in all, Niagara Falls was awesome. I'd love to go back at some point. "With the cherry blossoms near full bloom, a man peers through the fence to get a glimpse near the White House in Washington, DC, Saturday, April, 4, 2009." Although I live less than an hour away from the nation's capital, I've never once witnessed the cherry blossoms. I've even been to Japan twice and never even seen the real thing there either. That needed to change. Last year, after getting a last minute assignment, I failed to make it down to DC to see them. The following weekend when I had off, and it was reported that they had blown off the trees due to passing thunder storm. Drats! Waiting a full year for their return, I crossed my fingers hoping I wouldn't be thrown any assignments for the day of the huge Japanese festival that occurred on the same day as the blossom celebration. With some luck, I got only one morning assignment between Baltimore and DC and then made the pilgrimage down south. As per usual, I should have taken the metro as traffic was horrendous. The crowds really showed up in full force since it was probably one of the nicest weather days this spring. Once we found parking, we shot right toward the food as we were starved. Again, we experienced large crowds and ended up settling for Thai food rather than Japanese food. We wondered around for a couple hours enjoying the warmth of the sun and the blossoms. I wanted to make some pictures I could send to my friends in Japan and say thanks for the gift of the beautiful cherry blossoms, even if they had nothing to do with them. After getting sunburned we made our way over to Temari Cafe in Rockville which is probably in my opinion one of the best real Japanese restaurants near home. They also have a Japanese grocery store, where I spent more than $20. Oops. All in all it was simply a nice day in DC. 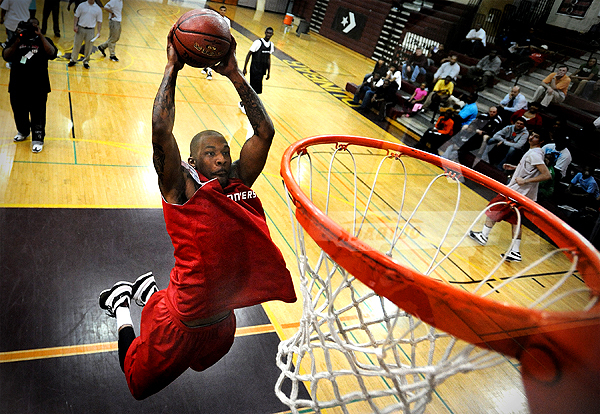 "Antoine Allen of Lake Clifton, playing for the Baltimore All-Stars, goes up for a slam dunk during the Charm City Classic three-point and dunk contest at Dunbar High School, Friday, April 3, 2009. Allen finished second in the dunk contest and will attend Miami next year." I was assigned to the Charm City Classic three-point and dunk contest at Dunbar High School where he would be playing. Basically, the most important thing, was to make some images of the two Maryland recruits. My editor also wanted some video of the dunking part of the contest. The only problem was that neither Maryland recruits did anything except sit on the bench. If I only knew that before I showed up. Without that in mind, I felt as if I could beat my deadline even if I had to take down a backboard remote after my assignment; so I set one up. Its been a while since I've ran one, so I was pretty pumped. Now, with that in mind, I made the nesscary phone calls to get the OK to put up a remote camera. In addition, I showed up an hour an a half early to setup. Luckly, I found a 12-foot ladder in the school and had the full support of the staff to put the camera up. They even helped me move the ladder and test it out a couple times. The only issue was that the coach of the U.S. All-Stars was having a practice with his squad before the competiton, so my window went from an hour and a half, to no more than 20 minutes. Atleast I got the two players I needed not just sitting. Luckly I showed up early. Working fast, and in one the hottest high school gyms ever, I did my best to make the backboard camera look good. Things looked acceptable (other than I totally missed one reflection). I even had a player slam dunk on it a coupe times, and it wasn't going anywhere. The night progressed and before I knew it was time for the dunk contest. Camped out on the baseline, Pocket Wizard in one hand, and video camera in the other, I watched as 20 players dunked one after another. But, as I already said, neither recruit dunked. I was really disapointed. I was hoping to get a shot of one of them at this angle. I knew that the paper wasn't interested in some random player not going to College Park. Nonetheless, I still moved two from the backboard remote hoping they'd land in print or at least online. No dice. Alas, I got a handful of usable frames from it. Could have been better, way better, with more than 20 rushed mintues to setup. Maybe next basketball season. Atleast I had fun and changed things up a bit. "John Carroll's Alex Mezzanotte (No.4) attempts to strip the ball from Notre Dame Prep midfielder Kelsi Bozel (No.29) as she fires off a shot during the second half at Notre Dame Prep, Thursday afternoon. Notre Dame Prep won, 17-9." When I was in college, I was always shooting lacrosse. This season, however, has been slow in regards of the fastest game on two-feet. I've been shooting a lot more news and feature stories, which I oddly enough actually like better than sports. 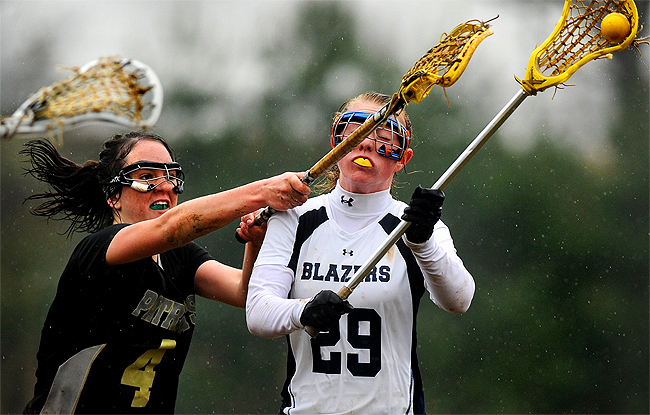 This was the first lacrosse game I shot this year and the weather was anything but a nice spring day. Spring it was, just not in a pleasant way. All morning it dumped rain. It had briefly stopped during the afternoon and I was actually hoping for the rain to start up again. Why? Because I like mud. While we've all endured many inclement weather sporting matches, and while they tend to be an added pain, I actually enjoy another element, obstacle for the athletes. There is nothing like a muddy pitch or a snow covered field to help create unexpected moments. As for the rainiest game I've ever shot, that award goes to the Ravens Vs. Colts in 2007. I literally had no idea what I was shooting, couldn't review my images and was completly soaked. I am pretty sure my rain coat is still dripping in my closet from that game. For this lacrosse game, I wanted to see mud covered players slipping all over the field. But to my dismay, everyone somehow kept their footing throughout the match. The pitch was drenched, but the players must have had some extended studs on their cleats. While the rain did make for a slower paced game, by the second half Notre Dame Prep had run away with the game and I found myself taking pictures of umbrellas. At one point, I had to shoot the only copy of the roster that the reporter was holding hostage so that I could later identify the girls in my images. Now that I think about it, I should have posted that picture of him holding the soaked piece of paper. That was more telling of the game than the above. Ha. Oh, well. 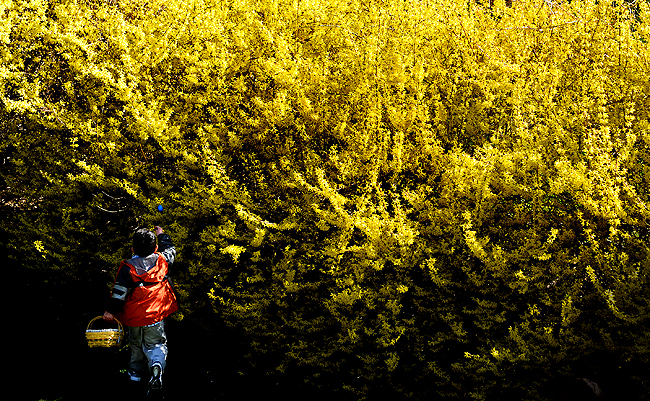 "Nicholas Neville runs toward the bright yellow forsythia bushes where a blue Easter egg fails to blend in during a egg hunt in Whiteford, Md., Sunday, April 12, 2009." More than 400 miles one way, I am finally back in the land of the free. I made it just in time for the Easter egg hunt. Canada was amazing and I had a blast. I'll be playing catch up the next couple days and will definitely have more updates on my Canada travels and some recent assignments I have been meaning to get up. In the meantime, I wanted to wish you all a Happy Easter, even if I am a couple hours late. I hope you all had a good time with friends and family. "Extending for the ball, Reggie Brown of The Adventist Knights wheelchair basketball team, attempts to pull in a rebound at the Emery Recreation Center on Wednesday night. Brown and teammates were practicing for an upcoming tournament." 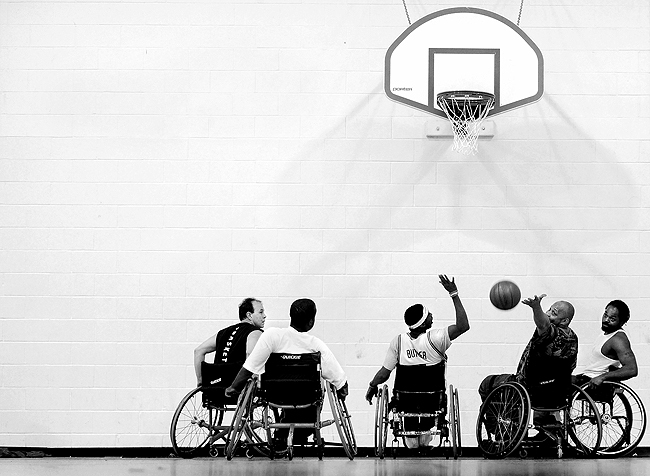 Last month, I shot for a client who was looking for some images of a D.C. based wheelchair basketball team. While I had to shoot vertical images 99.9 percent of the time there, I ended up having a lot of fun. The art director was simply looking for one image for the cover and one image for the inside of their publication. She suggested shooting the practice and then shooting some portraits following so that they could have more than one option to chose from. Easy enough. After making my way to the gym in D.C., where the Adventist Knights wheelchair basketball team practiced, I introduced myself to the team and told them I wasn't looking for them to do anything special. I simply threw up some lights and let them do their thing. The team was not fully assembled that night due to bad weather. Although as they practiced for their fifth anniversary tournament their was enough for a three-on-three full court scrimmage. What I didn't know, was the team is apart of the National Wheelchair Basketball Association (NWBA), which was formed in 1946 out of wheelchair basketball’s popularity among war veterans. Today the NWBA has over 200 teams that comprise six divisions. Pretty cool. These guys are strong, and the game rules, play and playoff formats are similar to those of NCAA basketball. In addition to competing nationally, the Adventist Knights also promote disability awareness throughout the Washington, D.C., area. Again, very cool. These guys could make for a great story, but it's quite a haul from Baltimore, not to mention, I recently saw a fantastic photo story on a wheelchair basketball team in one of the recent (or past year) contests. I'll have to find the link. Anyways, my art director for the assignment told me what she had in mind, so I shot mostly in that criteria, along with images that I thought would work. I mainly shot tight, but when they went down the other end of the court, I shot some overalls with ambient light and really liked the clean look of the white wall, hoops and chairs. Afterward, I asked some of the players if they would want to be in some portraits. Most, if not all, were really excited to get shot one-on-one and look like they were the next pro. I even shot one guy twice he was so pumped. I rigged up a nice, small portable studio in the gym and shot things my way. I wasn't sure if the magazine would like them. The art director in the end said that my portraits were a little edgy for their publication, so at first picked a more subtle image. However, in the end they went with this frame here. I was happy they ended up with that portrait and thought the final product with the banner and text looked awesome. 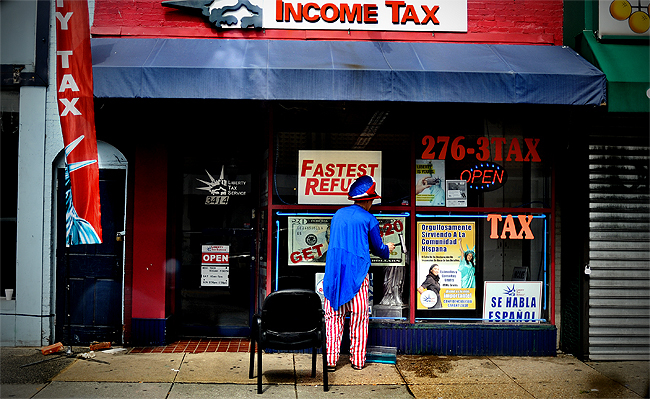 "As the deadline date for tax season approaches, an employee of tax service cleans the windows of the business on Eastern Avenue in Baltimore City, Sunday, March 29, 2009." I am blogging from another country. Close your eyes and take a guess. OK, you're back, what did you guess? If you said Canada, you're right. I am up here for five-days. This post is going to be short, more or less a potpourri of things. First, which links a few things together, last week I was headed to Fells Point in downtown Baltimore to cover a "flash mob" when I saw and shot the above from my car. What is a flash mob? Well, a bunch of people gathering to do something silly and then walk away a couple minutes later like it never happened. In this case, it was playing kazoos. OK, so what, is what you're probably thinking. Well, first off, I found out about it through Twitter. I've recently joined the network and finding it very helpful and interesting. I've added an icon at the bottom left of the sidebar so you can follow me now. With that, I also found a great promotion and finally bought a Web site through LiveBooks. That's right, now I'll actually have a legitimate place to showcase some of my favorite pieces of work, all in one place. As of now, I am waiting for the design call on Monday and once that is done, things will go live within the next couple of days following. So stay tuned. I'll be sure to announce the launch. OK, so what, is what you're probably thinking again. Well, I will have the typical galleries; the sports, feature, news, etc., but I will also have a couple cool, non-standard, different galleries. One of them being: While behind the wheel. Obviously, all the images will be from when I was driving, like the above. I've always kept my camera on my passenger (or backseat if someone is with me) because you never know what you might see while driving. I've even made posts on here about my [bad] habit. I may not post when in Canada, but then again, I might. If not, have a great holiday and enjoy this nice weather we've been having in Baltimore. I'll be in the snow most likely. "Unable to control her emotions, Rose Smith, Tetso’s grandmother, seeks comfort from her daughter, during a candlelight vigil in memory of Tracey Leigh Gardner-Tetso in Rosedale, Md., Saturday evening. Tracey Leigh Gardner-Tetso has been missing since March 6, 2005 when she was last seen at her residence in Rosedale, Md., before attending a Motley Crue concert." I tried to come up with the the saying in my own words, but it didn't quite work, so to quote John Tully, "[Sometimes] I'd rather photograph what the 30 other photographers are not, whether that is "decisive" or not because it's infact decisive." A couple weeks ago I was assigned to cover a candlelight vigil in Rosedale, Md. My editor was telling me it's something that happens every year and the emotion displayed in combination with nice, golden light would probably make a great photo. The story was like most other vigils, the anniversary of which a tragic event occurred. In this case, the disappearance of Tracey Gardner-Tetso. Though police found her car in a Glen Burnie parking lot 11 days after she vanished (can people "vanish"? Or do they "disappear"? I think I need a copy editor), her car contained no clues, police said at the time. And still, to this day, no clues have been discovered. From what I understood, it's certain that Tetso did not willingly disappear, although its been documented in other articles that Tetso had an unhappy marriage and was dating someone new. This would later almost make a connection later at this assignment. At the assignment, I showed up and introduced myself to the small group of those standing around. I wanted to find out who was family, and who were friends. Things went according to plan, but Testo's mother warned me to get ready to take pictures if anything shady happened. To understand her, I asked why and what happened. According to her, Testo's house is still in Testo's name and owned by her and her family, not the widower. So each yeah, the group walks down in front of the house, makes a circle and shares memories of her. Apparently, in years past, Tetso's widower, tried to run down the group in his truck. This is where I got confused. Why wouldn't the husband join in vigil of remembering his wife? He even called the police during this assignment. I don't know, and to be honest, I am not really trying to get in that debate. So I will return to my lead. I was competing not only with myself to get the one shot that told the story of this gathering, but two videographers from local television stations. After friends and family gathered, joined hands (and the police showed up), some friends started sharing stories. Obviously they began to get visibly upset. Especially one friend. I was showing compassion, being respectful and keeping a fair distance. I started to step in to make a frame when both videographers placed their cameras, no lie, six inches from her face. Disgusted, I dropped my camera to my hip and decided not to make a frame. 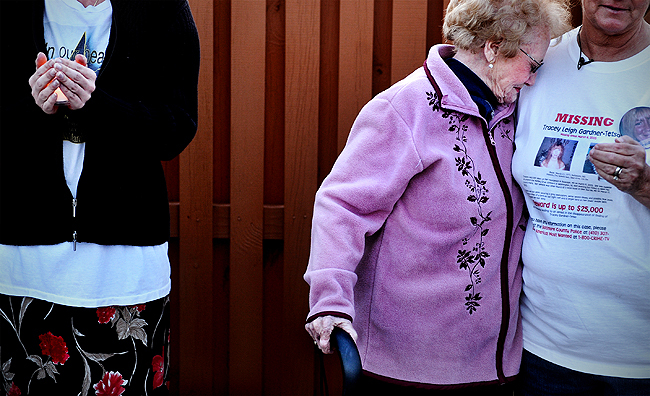 I instead turned around to capture Tetso’s grandmother seeking comfort from her daughter, Testo's mother. It may not be the clearest indication, and tears weren't shed, but I'd rather make a frame that isn't the most whether that is "decisive" or not because it's infact decisive. "Jess Harlee, who scored 28 points and made two key free throws late, is smothered by her teammates after Fallston beat defending champion Paint Branch, 65-62, during the Class 3A Maryland basketball championship at UMBC's RAC Arena, Saturday, March 14, 2009. With the win, Fallston celebrated the school's first basketball state championship and posted a perfect, 28-0, season." A big part of me is glad high school basketball season is over, but after finishing the season with one of the best women's games I've ever seen, and a historic one at that, I sort of miss it. Living not far from Fallston high school, I grew up battling against them every year. It was my high school's biggest rival, especially in lacrosse. That's beside the point; I knew that this game was much more than another state championship game in Maryland. Fallston was entering their first state championship game and were posting an undefeated season. Not to mention, they were under direction of an intermediate coach, as their head coach was out this season for medical issues. If those things weren't pressure enough, they were posted up against Paint Branch, the defending Class 3A Maryland basketball champions. This game was slated to be a great match up, and for Fallston, it was going to be a display of raw emotions no matter what the outcome. I was sure tears would be visible if they went undefeated, and obviously, if they were unable to capture the perfect season. As per usual, I showed up early and the arena was packed. More than 3,000 fans were in attendance for this game. My college didn't even get that many people for football, lacrosse and basketball games combined. After the tip, the game was action packed. The game was fairly close, see-sawing back and forth, between the two schools. But the real action came in the final quarter. Fallston was down by seven with under a minute left in the third quarter. To say I was rooting for them would be wrong, but deep down inside I was. I wanted to have them not only knock off the raining champs, but capture that perfect moment and season. As the fourth quarter began, they jumped out fast and turned the game around in their favor. They took a 48-44 lead after an 18-2 run. They seemed confident, and before I knew it, then they were running away with the game as they had a commanding, 59-48, lead with about a minute left. I was starting to plan my approach to the celebration and moved down toward Fallston's bench after a time out. But as with all basketball games, the final minute turned into 20 minutes. That huge lead had vanished and Paint Branch was within two points of ruining they're perfect run. The score was 63-62 with about five seconds left. I know my hands were sweating and my heart was pounding, but so was Fallston's Jess Harlee's. After being fouled by Paint Branch to stop the clock, she stood at the free-throw line with seconds left, clinching her chest, looking like she was going to pass out. But she hit two clutch free throws with 3.3 seconds left as Fallston held off Paint Branch, 65-62, for the title. The Cougars rushed the court and smothered Harlee. Literally, the crowd went wild. It all happened so fast, and my deadline was past, but the paper wanted a reaction shot, and so I waited to move any images. In a matter of maybe three minutes, I captured the frame of the jubilation, downloaded, edited, captioned, and moved it over to the paper. I initially moved this frame here. The first moment of pure joy. But after going back, I liked the posted image better, where the team really started to pile on nanoseconds later. I still can't pick which I like better. What do you think? It was a great adrenaline rush to end the basketball season, and one helluva game, too. As for Harlee, she was probably the star of the school the next day. She scored 19points in the fourth quarter alone, including 10-for-12 from the free-throw line, not to mention, two clutch free-throws.